Sitting in a circle is a fundamentally different experience than sitting in rows, or meeting across a desk. When we are in rows there is generally someone standing in front, commanding attention. Clearly this is the person who is in charge, who has the answers, and to whom the group is accountable. When we are meeting with someone who faces us from behind a desk, we also know instinctively that the authority and power belongs with that person. These arrangements have their appropriate functions and restorative practices are intended to complement rather than replace them completely. They can be effective. However, their effectiveness may have unintended consequences. One of these is the implied lesson that the responsibility for the functioning of the community is on the shoulders of the person who holds authority. When we sit in a circle we experience a stronger sense of community. Every person in the circle shares responsibility for its functioning. Circle culture is more “yes-and” than “either-or.” Yes, there is a leader, and each person takes the lead in turn, each time it is their turn to speak. Yes, some guidelines are given and the group makes its own agreements. Decisions are made, but by consensus of the whole group, and sometimes this means decisions come slowly or take unexpected forms. Thus, one of the main purposes of circle dialogue is building community. Another purpose is supporting the kinds of honest, authentic dialogue that is necessary to effectively respond to challenging behavior and circumstances. These two intentions for circles take shape as two different types of circle: community building and responsive. A premise that runs throughout this resource is that responsive circles (for responding to misbehavior and harm) work best in classrooms where a foundation has been developed through community building circles. Circles work best when the physical space has an open feeling of no barriers between participants. Arrange the space so there are no tables or desks between students or in the middle of the circle. If your classroom or the furniture you have does not support this perhaps there is another place on campus where you can go for your circle meetings. Acoustics are another important factor. Some rooms are acoustically jarring, with surfaces that reflect and amplify sound, making it difficult to hear. Many cafeterias and multipurpose rooms have this acoustically harsh quality. They can give students a sense of privacy within the background noise, thus encouraging side conversations. Other rooms (libraries are often like this) have a way of mellowing sound and giving a quieter feel; this is far preferable. Outdoor spaces can work well if the background noises are not too intense. You may find that a circle on a playground during the "quiet time" between recess works fine, or you may discover that neighborhood delivery trucks are much louder than you ever realized! A talking piece is used frequently during circle. It can be anything that is easily passed from one student to another. Beautiful objects found in nature make great talking pieces—feathers, driftwood, river stones, seashells. Animal figurines are appreciated by many students. Some classes adopt a particular talking piece and use it for every circle. Some put a variety of talking pieces in the center and let the student who starts a round choose one for the round. 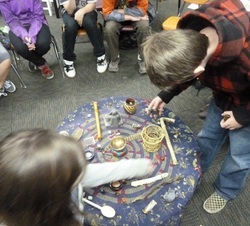 Some classes make a project of creating a talking piece and then over time adding to it. For example, you can keep a box of large beads and then as a class define a trigger event that signifies when a new bead will be added by lacing it on to a string that is tied to the talking piece. Perhaps this occurs when a conflict has been named and solved. 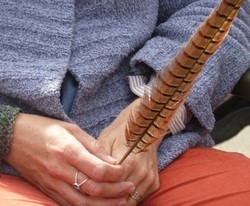 Perhaps it can be as simple as a new bead (or feather, or ribbon, etc.) for each time the class meets in a circle. You will not always use a talking piece; sometimes it will make sense to simply call on students who raise hands. But the great advantage of a talking piece going around the circle is that each and every student knows that they will have a chance to put their voice into the center, and to be seen by others. When you do set the talking piece aside, do so explicitly—call attention by to the shift away from the talking piece by saying, “I’m setting the talking piece aside for now.” Do the same when you pick it back up. These are some of the things we keep in our Circle Kit, which is a basket we carry with us to all of our circles. You can create your own toolkit that reflects your particular style of circle leadership. Bell—a small “singing bowl” style meditation bell. Talking pieces: a selection of 3 to 6, various items including sticks, stones, seashells, feathers, stuffed animals, toys, and so on. Fabrics: a few fabrics that have rich colors and/or textures, sufficient to cover an area about 3’ on each side. Battery-powered LED candles are a safe way to create a sense of warmth emanating from the center of the circle. Placed in the center, they represent the traditional “children’s fire” kept to remind the community to act with awareness of its responsibility to the children present, and those yet to be born. Bowl: Find a handmade bowl that can hold water or stones. You can float flowers in this bowl. Kalimba: An African musical instrument made with a gourd and spring steel tines. Rattle: Any kind of rattle will do. It can be used as a talking piece, or can be given to a student to use during the circle to signal if the circle needs to refocus. Animal Figurines: Make great talking pieces representing each animal’s unique characteristics. If given a selection of different animals, students will often choose one whose characteristics mirror the current process of the classroom community. The center of the circle is an important element. While it can be left clear, it is often more powerful when something is placed in the center to provide focus. Creating the center can be part of the ritual of moving into circle time. Students often enjoy doing this; after modeling it once or twice ask for two or three volunteers to come and arrange the center, working with elements that are kept in a basket or box for that purpose. A colorful piece of fabric with a few small items such as flowers, feathers, a selection of talking pieces, and so on will do nicely. A bowl of water in the center can help bring a sense of calm to the circle, and can be helpful when there is conflict or tension in the room. It is traditional in circles to speak into the center. The idea is that everyone’s voice is added to the center, and it is from the center that the wisdom of the class will begin to emerge. Once someone has spoken into the center, their contribution becomes the property of the circle. It becomes part of a shifting story, a pathway toward an understanding that comes clearer little by little. The principle of non-interference means that we simply welcome what people say without trying to influence them. If someone is in pain, we listen and allow simple listening to be a comfort; we do not try to take away their pain. If someone is confused, we simply listen and trust that in its own way the circle will provide clarification. If someone is angry we honor their anger. We don’t indulge in psychological maneuvers. We don’t directly correct, try to counsel, heal, or “fix” anyone’s experience in anyway. We simply listen. This principle, so very important in building a community where people feel safe to express themselves, also applies to restorative dialogue. When we use the restorative questions we are not trying to force an outcome. We are simply giving a structure to the circle so that each person’s voice can be heard. When all voices are in the center, the circle has a way of surfacing what is true, what is needed, and what to do next. There are exceptions when it is important to give information. We didn’t practice non-interference when students shared their fear that the Japanese tsunami was about to strike their school. We gave information. This illustrates an important point: we don’t want to be rigid about any of this. Non-interference and the other guidelines in this resource are principles, not commandments.